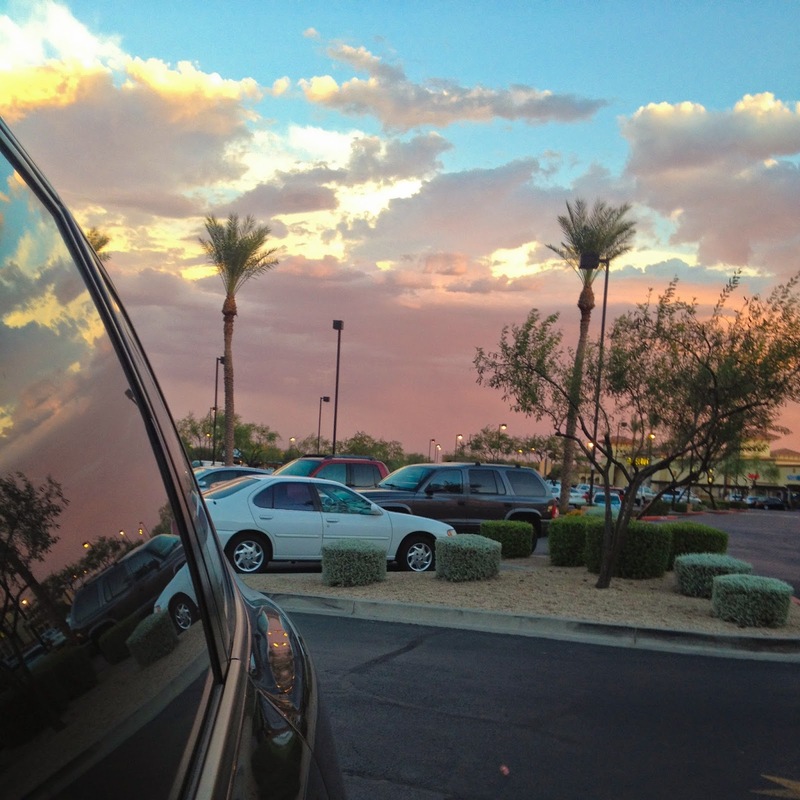 At the beginning of the summer, it was the haboob. If you aren't familiar with haboobs (goodness knows I wasn't before moving to Scottsdale) they are giant, intense dust storms. You see, we get big summer rainstorms out here in the desert (monsoon rains) and the changes in wind and beginning of those storms sometimes cause dust and clay to be kicked up into a wall of debris that precedes the rain. This can all happen very rapidly. Unbeknownst to me, it was happening while Max was flying in from Alabama one afternoon. 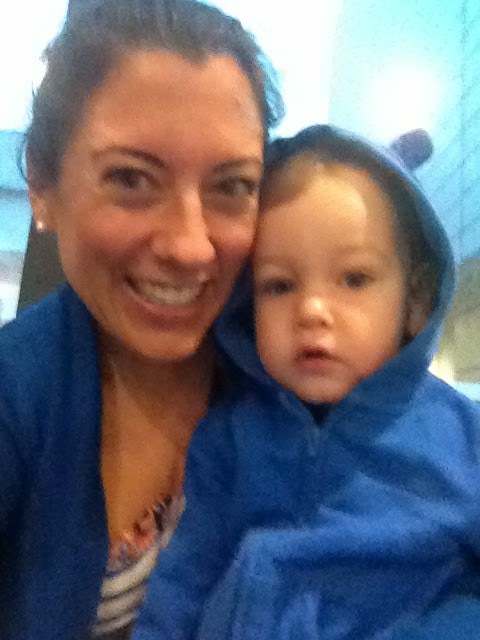 Little man and I headed out like normal to pick Max up from the airport, and stopped for an early dinner on the way. Parker makes the best dinner date. We were fixin' to leave when someone walked into the restaurant and commented "the dust storm is coming!" We walked out to Pepper to find this unusual sky. Was there a dust storm coming? Well, I wasn't sure. I had turned off my "Emergency Alerts" on my iPhone several months prior after repeatedly being woken up in the middle of the night with warnings of flash floods that were nowhere near me. I tried googling "dust storm Phoenix" but only came up with past articles about Haboobs. So, onto the freeway we hopped. 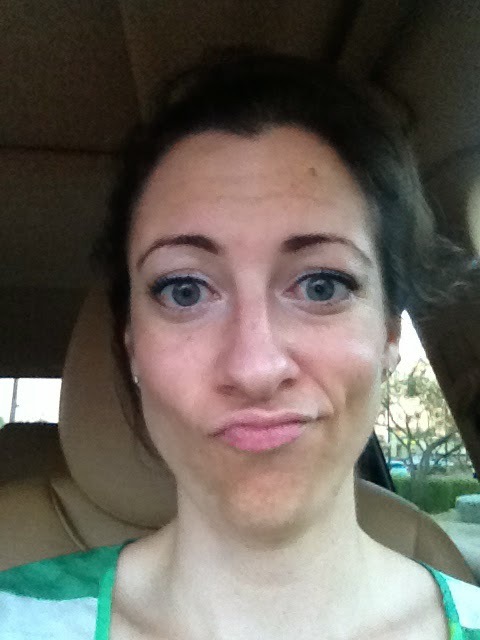 I took a "I'm not too sure about this" selfie before I left the parking lot. The first few minutes on the freeway were okay, then the sky got dark, the highway lamp posts turned on, and then, I spotted it. The wall of brown. Coming. Toward. Me. Enveloping everything. It was the first time I had actually been out in one of these storms (I had been lucky in the past and weathered them out in the comfort of our home, most often not even knowing a dust storm was happening). There was no way around it and within seconds my visibility was next to nothing and random debris was blowing by (trash, tree branches, concentrations of dirt). I was scared sh!tless. Too scared to even snap a photo, but that wall of brown was no joke, and it was never-ending. I mentally kicked myself for turning off Emergency Alerts. Lesson learned. I had two options - to continue forward on the freeway (I was going at a snail's pace at this point, following the distant glow of drivers ahead) or, I could pull over. I was racking my brain for the advice the news gives out for these situations, but it always seems to be conflicting (they say to pull over and turn off your headlights so your diffused-in-the-dust glow doesn't blind someone - however sitting on the side of the freeway without any warning lights seems like an invitation to be hit). I decided to pull off at the next exit, however when I reached it there was a car stopped halfway down the ramp, right in the middle of the road with their hazards on (obvi they did not watch the same news segment). Not wanting to crash into this person, I continued on the freeway, more freaked out than ever, praying everything would be okay. 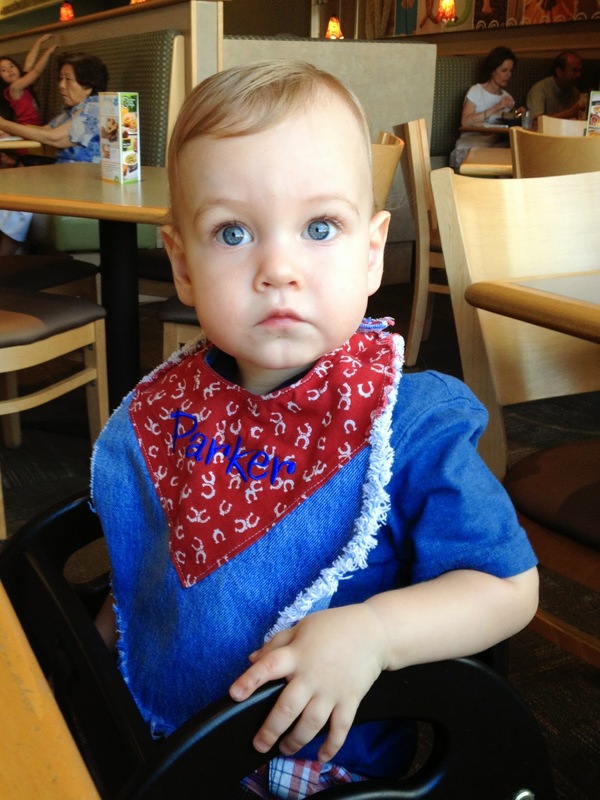 Parker, luckily, was such an angel through all of this. We finally came up on an off-ramp and I took the exit with no other cars in sight (which was a vey eerie feeling). I pulled into the first parking lot I came upon and parked in a spot. I talked to Parker about our "break" to wait out the weather, then secretly wondered if I should move to a different spot as there was a distinct possibility the wind was going to blow a tree onto our car (did I mention the wind?? Because it was crazy at this point). I really didn't feel safe alone in Pepper with my baby in the backseat, so I made the decision to take refuge at the Marriott. I parked as close as I could to the entrance, covered Parker with a towel, and ran inside, worries of Valley Fever floating around in my head. Really though, it was the best decision. The staff was so welcoming and gracious; they showed me a comfy area where we could rest, plus they loved Parker and even brought him snacks. It was so much better being inside an actual building and I felt much safer around other people. Parker and I ended up spending many hours here. I obsessively checked the status of Max's flight, obviously worried sick about my husband who was flying in the mess. All I wanted to see was the "landed" status of his plane, but instead I saw "diverted to Tucson." That's right, I later found out that Max's plane circled PHX for so long (unable to land in the haboob) that they finally had to reroute to Tucson because they were low on fuel. 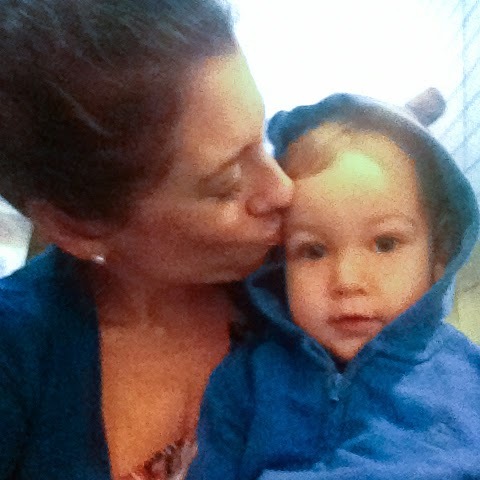 At this point, the sweet staff at the hotel offered me a very discounted rate to stay with them for the night, but Parker and I ended up heading to the airport close to midnight when Max finally got in (and once the storm had mostly passed). You'd think that one flight during a natural disaster would be enough, but as it would happen, Max had a flight out of Phoenix last Monday. 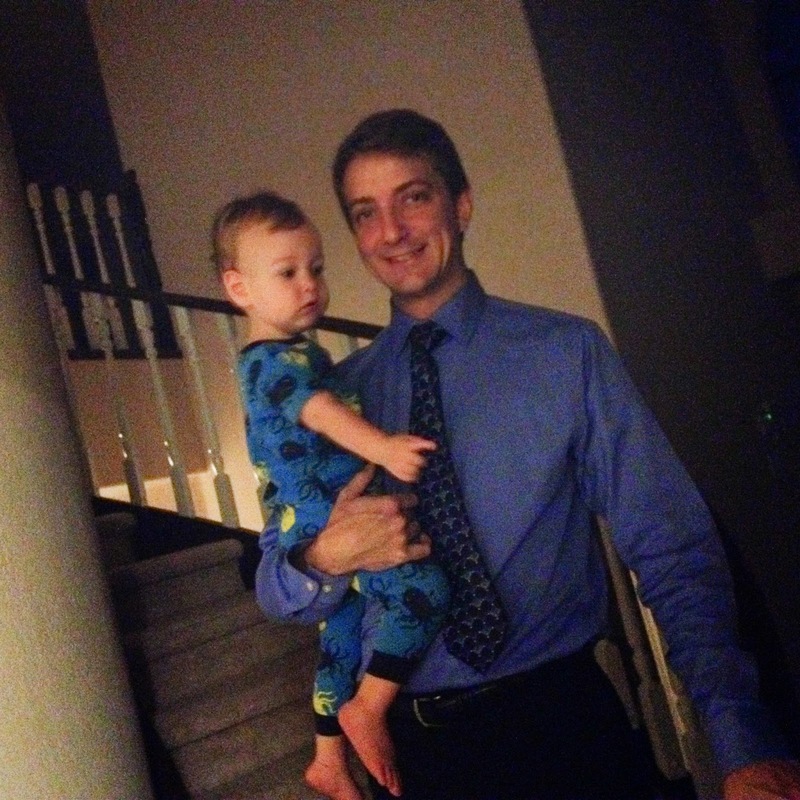 This one was an early AM flight; I snapped this photo around 6am as we were headed out to the airport (Parker still in his jams). It had been raining all night, which we knew. We even got the "Flash Flood" warnings on our iPhones in the middle of the night (yes I will never turn those off again!). Max ended up driving Pepper to the airport with me and Parker in tow because it was still raining hard and any rain in the desert is usually a disaster to drive in. 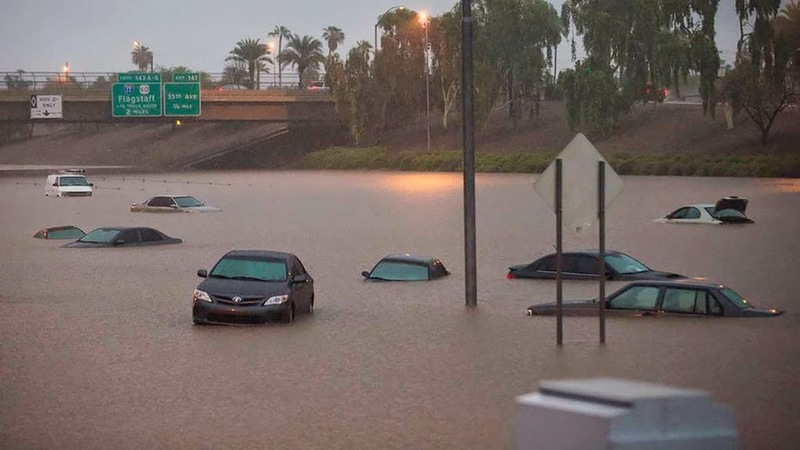 What we didn't know was that last Monday ended up being the rainiest day in Arizona history. This is what Highway 10 looked like while we were driving to the airport. Luckily, we were not on the 10. We have two routes that can take us to PHX, the 101 or the 51. Fortunately, we chose the 101 which I think ended up being the only freeway that didn't close. 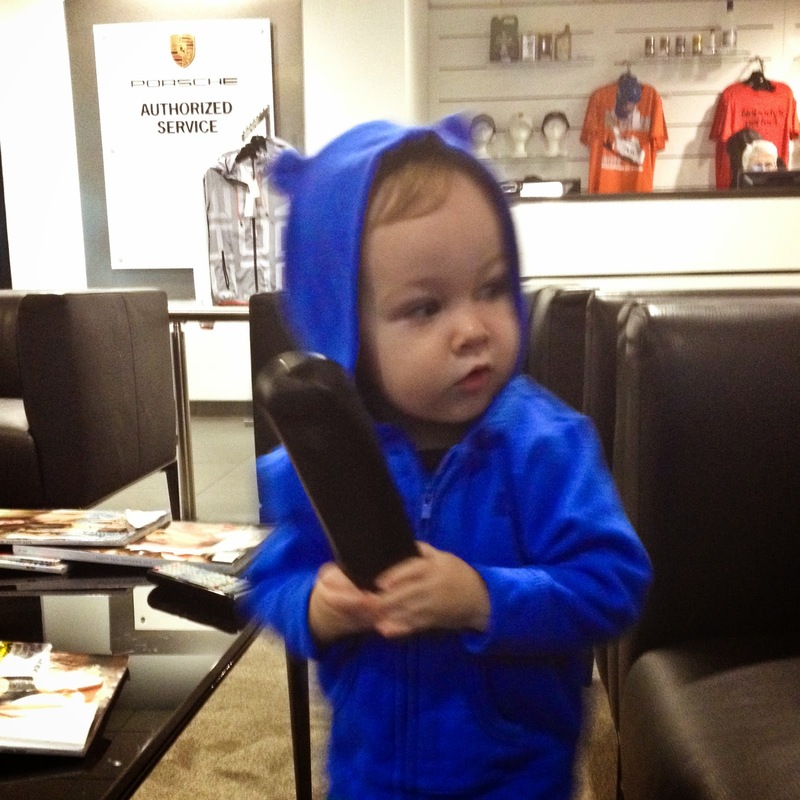 I had a 7:30AM appointment at Porsche to get Pepper's oil changed. After dropping Max off at the airport, I should have had plenty of time to get coffee and breakfast pre-appointment, but with the storm I barely made it on time going straight there. We walked in and the entire dealership was glued to the news, which was showing the worst of the rain (which was luckily concentrated south and west of us). They joked that it would be a Cayenne-only day (as Porsche's smaller sports cars would not be able to make it out in the flooding). 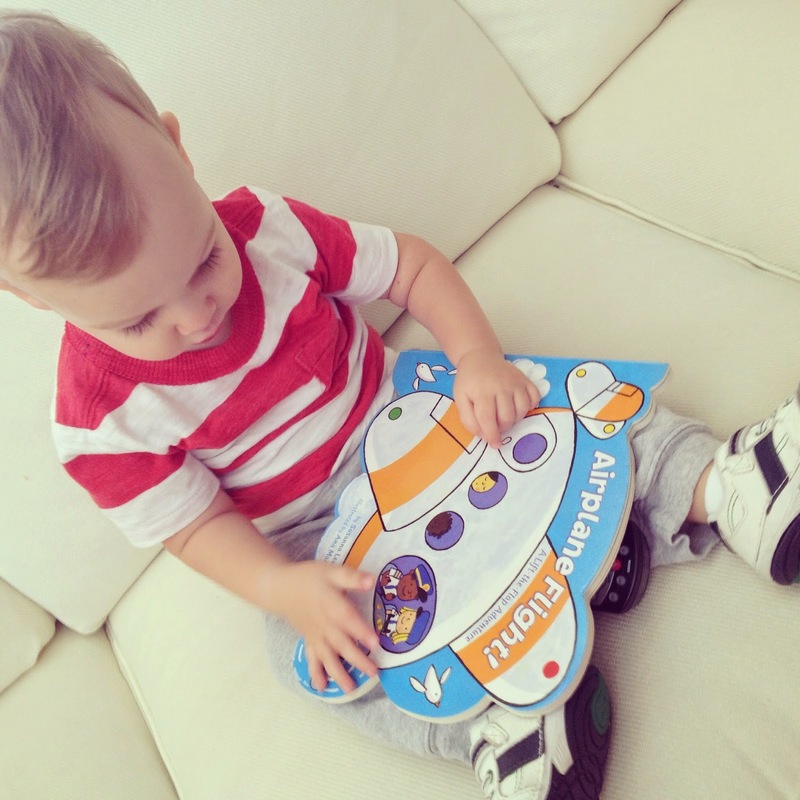 Parker made himself at home, finding his favorite toy (the remote control). 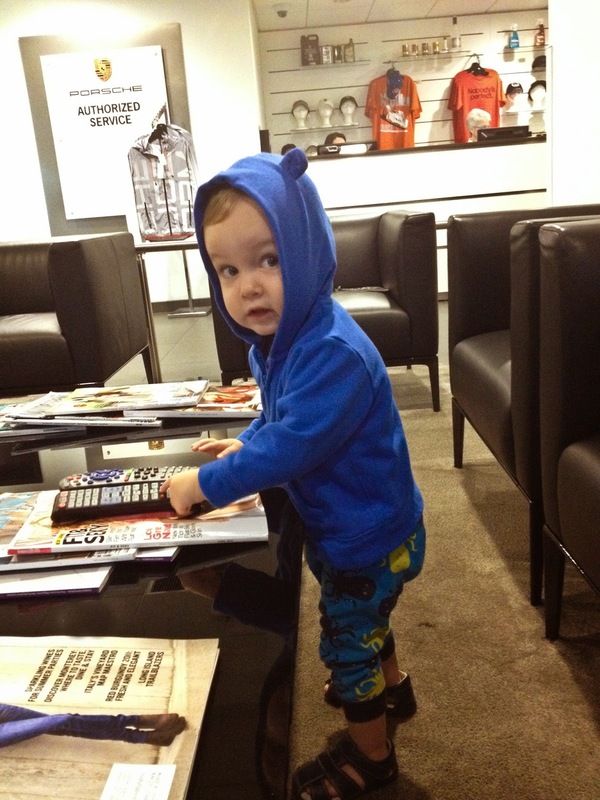 This picture cracks me up because it looks like Parker is attempting to sneak it out of the dealership. I was slightly worried about the drive home, but our service guy assured us I was "driving a tank." 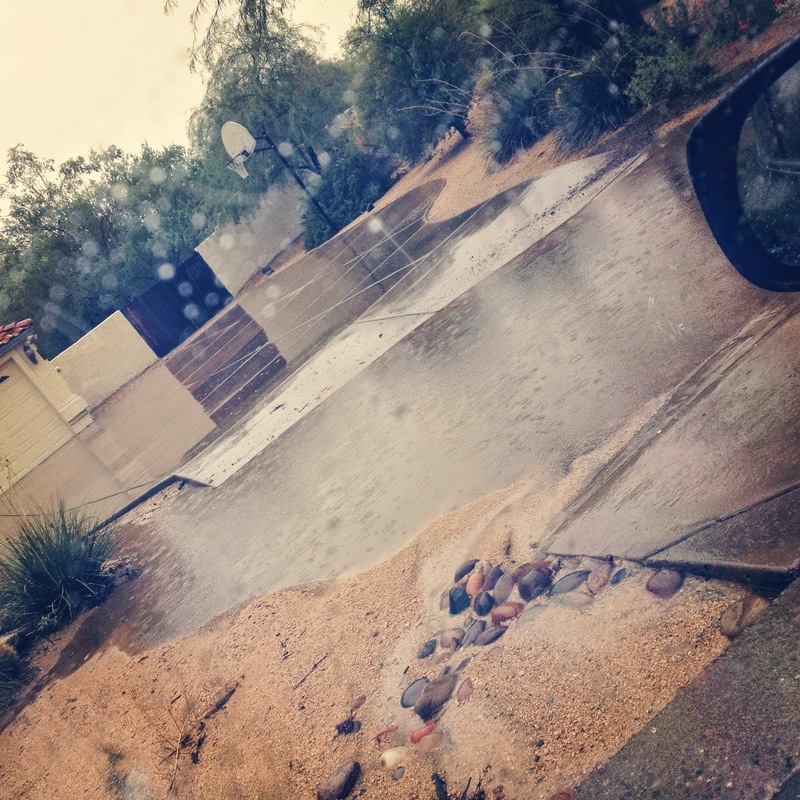 And I needed it for the drive home, this is what we drove up to at the house: a moat! Here's hoping Max's future flights will be on sunshiny days!! Or better yet, here's hoping that we will all be living together soon and these flights won't be necessary!